You just can’t beat a fall night spent sipping on Pumpkin Ale and learning from a line up of experienced marketing professionals speak about their craft. These four nailed it. Although the discussion started with consumer trends, at some point the discussion veered towards the future of consumer behavior and the rapid developments in AR/VR as well as the need for more personalized experiences online. 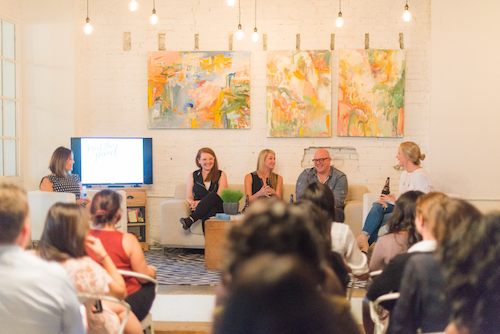 Although no one knows for sure what the future will hold, we are confident that with continued education and conversations like these, Atlanta will be ahead of the trends. One theme that we were happy to hear throughout the evening was the prevalence of social media. As technology advances and consumers become more savvy in their purchasing behavior one thing remains very clear: consumers will continue to seek personal experiences and authentic interactions online. Social media continues to be the community that audiences lean into to feel more socially included. Social networks will not fade away, they will only continue to be more important in a company’s marketing strategy. If you are already present on social media, that’s great, but it’s time to take it a step (or 5) further. The expectations have been raised and the standards for authenticity will be at an all time high. If you’re worried your brand isn’t taking the appropriate steps to meet exceed your customer’s needs or you don’t know how to reach your audience online, contact us! Or, come to our next Double Tap The Keg event. Stay tuned.